Kristin Creative: Something to Look at Sunday?! Ya, mon! Something to Look at Sunday?! Ya, mon! As some of you may or may not have noticed, I've been absent from the blogs (though I was everso sneaky by scheduling a few posts--still catching up on those great comments from the post about writing on a schedule... good stuff!). I have good reason for my absence! Instead of rice, we threw flower petals! The water of the Caribbean is unlike any other place. Pictures can't even capture the true color. Another photo of last night's sunset. It was a great experience... I have the sunburn on my nose and shoulders to prove it! So what does "Wa gwan?" mean? Any guesses? My guess is: Wa gwan = Where are you going? Am I right, am I right? No idea what it could mean but definitely glad to have you back!! The pictures look absolutely gorgeous & it is VERY hard to capture the ever so many colors of the ocean there! YAY! I love those pictures! And I'm still so jealous you where there and we were stuck here!!! Hmmm...I'm going to guess "What's up?" AND I love these photos...all of them! Gorgeous! I think you're right about the water, though I have gotten some good shots, it still never quite does it justice. I'm with Kimberly!!! I'm so jealous that you were there and we were here! Though the weather was nice here it's no sandy beaches and beautiful oceans!!! Glad you had a fantastic time!!! You looked so cute in your dress!! Who doesn't love throwing rose petals, thats so fun! 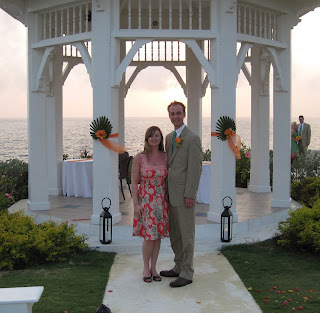 Hey, I got married in Jamaica, too! We did a destination wedding in Runaway Bay last June. It was awesome and the wife and I often talk about how much we'd like to go back... especially for the rum cream, mon! How gorgeous! I wish I was there--I'm quite done with cold weather, thank you very much. Wa gwan? I have no idea what that means. I can't even concentrate 'cause the pics are so beautiful. You're killin' me here, Kristin, killin' me! That's so purty!! Lucky you!! Oh, so fun. Mean ol' photographer trying to balance out his photo! Aww, this looks absolutely dreamy! And I love your dress! Awards! 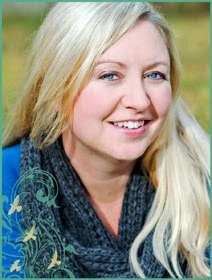 And Blogs You Should Be Following! Rough Day at the Vet! I've Been Tagged! It's Boyfriend Book Time! Does Your Manuscript Have Lice? Playing Catch Up... and an Award. Contest Winners!! And February Recap.